With the OCZ Throttle 32GB being capable of running via either USB or eSATA, several of the benchmarks used in today's testing will be conducted using both of these connection methods. This will give us a clear picture of just how essential the eSATA interface is to the performance of the drive. Additionally, one of the fastest USB based flash drives we've reviewed on OC3D to date; the OCZ Rally2 Turbo 4GB will be used as a comparison drive in all of the benchmarks. It is also worth mentioning that the MSI AM3 based motherboard used in to todays tests actually features fully powered eSATA ports, so using the included USB cable for powering the Throttle in eSATA mode was not required. For further information on this motherboard and other products in the MSI range that feature powered eSATA, please visit their microsite here. With the first lot of results in it's clear to see just how much the eSATA interface benefits the performance of the Throttle 32GB drive. In the Average, Minimum and Maximum Read results the Throttle pounds the Rally2 Turbo into the ground with results coming in at more than double of its USB based stablemate. The same can also be said for the latency results where the 0.7ms access time of the Rally2 Turbo is trounced by the almost non-existent 0.2ms results of the Throttle. Only when the Throttle is disconnected from eSATA and run purely from the included USB cable does give the Rally2 get a chance to fight back, showing that maybe the Throttle isn't the best choice of Flash Drive if you have no intention of using eSATA. Moving on to the file read/write facility in HD Tune, a 64mb file was written to each of the drives a total of 15 times in chunk sizes ranging from 0.5kb to 8192kb. 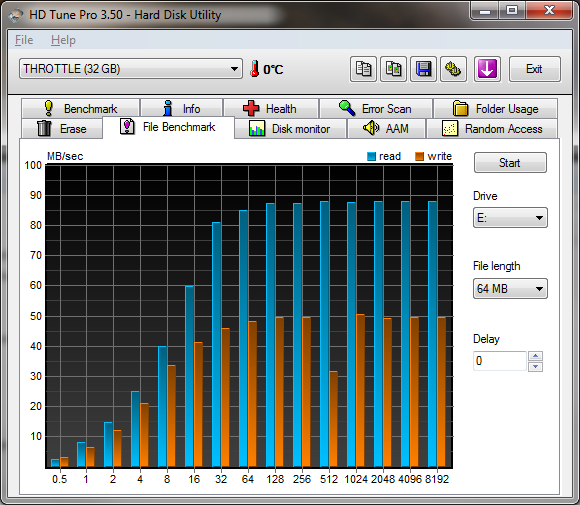 Taking into consideration the scale of the graphs, the Throttle once again shows that when combined with the eSATA interface it can completely walk over USB offerings, producing read results almost 3x higher. Write results are also extremely good with the Throttle beating the Rally 2 by around 10MB/s despite not even reaching the throughput limitations of the USB interface. 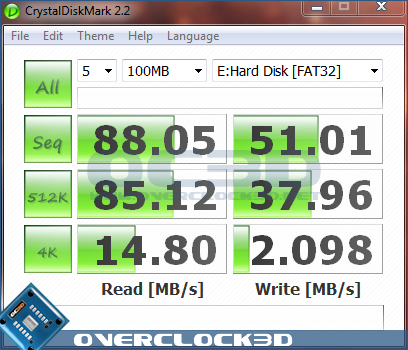 CrystalDiskMark somewhat echo's the performance results from the previous benchmarks with the Throttle once again leaving the Rally2 in the pits. Sequential read performance is a massive 56MB/s faster and write performance is almost double. Similar results can also be seen on the 512k read/write results, and finally the 4k results are still very much in favour of the Throttle. 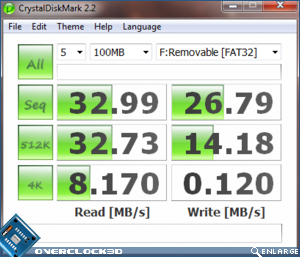 Finishing up with a benchmark that closely resembles a 'real-world' scenario, a 1GB folder filled with various sized files was copied to each of the drives with the time taken to complete the task being recorded using a stop-watch. Both the Rally2 and the Throttle managed to complete the transfer in just shy of 1 minute when connected via USB, but these results were soon drastically overshadowed by the Throttle connected via eSATA, which managed to complete the transfer in under 10 seconds!! Simply awesome.